Here at Able, we’re always on the lookout for ways to help our contractors provide more value to their customers. When you’re equipped to succeed, our success will follow. One great way to provide additional comfort to your customers and increase your own profits, especially in forced air applications, is through IAQ products. Air purifiers are an excellent addition to any system, but finding the perfect one can be tricky. Or, at least, it could before the Nu-Calgon iWave-V came along. The iWave-V is a universal IAQ option for ducted systems, including SDHV systems like Unico. It can handle systems as large as 6-tons with airflow velocities as high as 2,400 CFM. The iWave-V features one of the most contractor-friendly designs we’ve ever seen in an air purifier, that’s why we had to add it to our catalog as soon as we saw it. This low-voltage air purifier boasts an average installation time of 15 minutes. To ensure that installation is as easy as possible, the iWave-V supports multiple installation locations. It can be placed within or outside of a duct, near the indoor fan, between the filter and coil, on in the supply air. It utilizes magnets, allowing for a tool-free install in most circumstances. In addition to installing quickly, the iWave-V is also very low-maintenance. Cleanings can be handled whenever you clean or swap the home’s filters, and it can be cleaned as rarely as once per year without affecting performance in most applications. The iWave-V also includes a 3-year warranty, demonstrating Nu-Calgon’s confidence about its reliability and durability. For something that installs in 15 minutes and costs less than comparable models, the iWave-V is actually a very sophisticated piece of equipment. It utilizes needlepoint bi-polar ionization to purify the air. This method kills mold/bacteria/viruses, reduces allergens/smoke/static electricity/air particles, and controls odors. It even helps keep coils cleaner! One particular application in which the iWave-V excels is in multi-family units. If your clients are sick of smelling their neighbors cooking, one of these is all they need to protect their home. 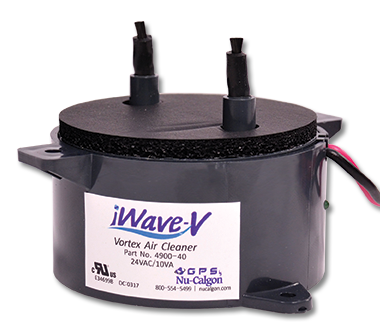 When used with a simple filter, the iWave-V is a complete IAQ solution. With a 15-minute install time, a low price, and the versatility to fit almost any application, the iWave-V is a brilliant addition to any quote. Be sure to keep a few in your truck, too; you never know when an IAQ opportunity will present itself. Check out the resources below for more info, then stop by any Able branch to place your order! Napoleon Wants to Give You a Free Grill!